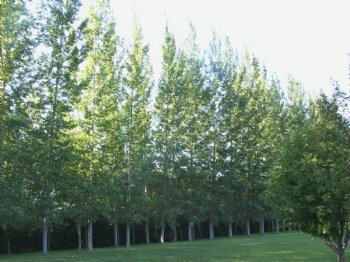 'PRAIRIE SKY' POPLAR - originating from a cross performed at the Morden, Manitoba Research Station. 'Prairie Sky' is an upright, vigorous male selected for form, disease resistance, and winter hardiness. Height to 50 to 60' and a spread of only 6 to 8 feet at maturity. Good form for screen plantings and single row belts on high value land.